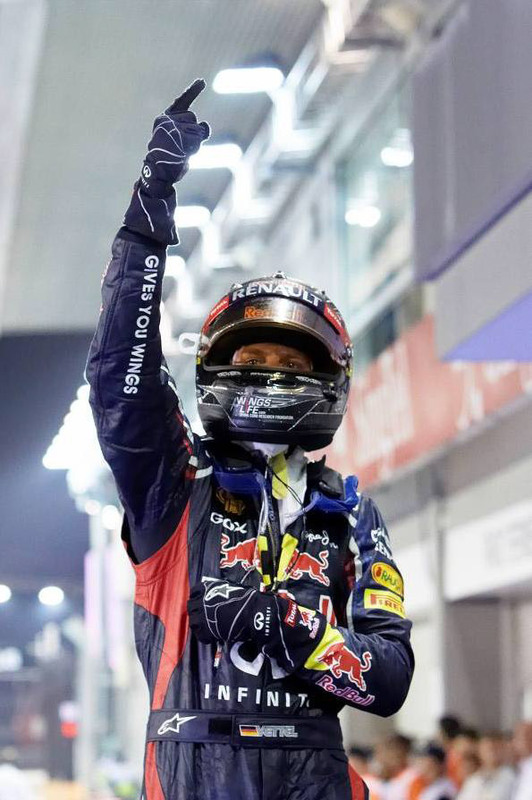 23 September 2012, Singapore – Sebastian Vettel is on the hunt for a hat-trick of world titles after his Red Bull Renault took its second successive Marina Bay victory in Sunday's 2012 FORMULA 1 SINGTEL SINGAPORE GRAND PRIX. The 25-year-old German pounced when early race leader Lewis Hamilton, whose McLaren Mercedes started from pole position, retired with a gearbox problem after 23 of the scheduled 61 race laps. Singapore has always come close to Formula 1's two-hour time limit and the fifth running of the night race finally went beyond – the Grand Prix ended after 59 laps with Vettel a comfortable 8.9 seconds clear of Jenson Button in the second McLaren. Third for Ferrari was another two-time winner in Singapore, Fernando Alonso, who fought through from fifth place on the grid to claim his fourth podium in five Marina Bay starts and limit the damage to his World Championship hopes. "I'm very happy – this is one of the best races to win: in terms of atmosphere and everything it's a little bit special here," said Vettel. "It's a surprise in a way: we haven't been racing here for 50 years but still it feels like a real classic already! It was great to win last year but to repeat this year is even greater." As the winner crossed the line fireworks soared into the Singapore night sky behind the Pit Grandstand as Vettel and the city together celebrated five years of spectacular night racing at Marina Bay. Alonso now has 194 points but 25 points for the race win take Vettel past Hamilton and Kimi Raikkonen into second place with six races remaining. Raikkonen claimed his own first points in Singapore with sixth place for Lotus. As well as Vettel, another German World Champion repeated his Singapore result from last year – but for Michael Schumacher it was a much less happy experience. His Mercedes slammed into the back of Jean Eric Vergne's Toro Rosso at Turn 14 after 38 laps, damaging both cars but happily leaving both drivers unharmed. In earlier Sunday track action the DAMS team enjoyed another wonderful Singapore day when they added the GP2 teams' title to the drivers' crown taken on Saturday by their lead driver Davide Valsecchi. While Dutchman Giedo van der Garde won the sprint race for the Caterham Racing team, Valsecchi and teammate Felipe Nasr finished fifth and seventh, enough to end the day six points ahead of Lotus GP, for whom only Estaban Gutierrez scored points in sixth place. In the Ferrari Challenge Trofeo Pirelli a mid-race incident brought out the Safety Car, which controlled proceedings for the entire second half and the 30-minute time limit saw the race reduced by one lap to 11. That deprived former Formula 1 driver Marc Gene of the chance to storm through to the podium. From the back of the grid the Spaniard had made his way into the top 10 with six laps still to run, but in the end it was French driver Alain Li who claimed the victory ahead of Thai driver Pasin Lathouras and Singapore favourite Ringo Chong. No such luck for Ringo in the final support race, the Porsche Carrera Cup Asia: a 360-degree spin on lap seven of the twelve dropped him down the order and it was Craig Baird in the SC Global Racing entry who won for the third time in this class in Singapore. Second was Team Eagle's Martin Ragginger, with series leader Alexander Imperatori third for PICC Team StarChase, a result that cemented overall success for the Shanghai-based Swiss driver ahead of defending champion Keita Sawa. Pop princess Katy Perry, decked out in a race-inspired chequered one-piece suit, matched the post-race fireworks with an explosive set at Padang that involved spectacular onstage pyrotechnics and a dazzling repertoire of hit anthems like 'Hot n Cold', 'Firework' and 'California Gurls'. 50,000 spectators were duly rewarded as Perry produced some scintillating moves of her own on a 30-metre-long runway that brought her closer to her fans.